Arab extremists plan two 'major' events this week to protest Israel's Six Day War victory - but not many people expected to turn up. Security forces were gearing up for two major protest events this week by Arab and left-wing extremists. 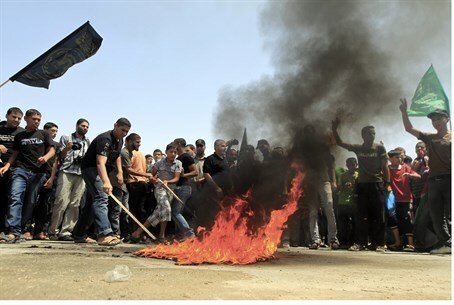 Thursday marks “Naksa Day,” in which Palestinians demonstrate against the liberation of Judea, Samaria, and much of Jerusalem in the 1967 Six Day War. Similar to “Nakba Day” - which mourns the Israeli victory during the 1947-48 War of Independence - Arabs in Israel and Palestinian Authority-controlled areas of Judea and Samaria hold protests and marches “mourning” their losses in the war, and the return of Jews to their historic homeland. While there is a great deal of hype surrounding both events, they have generally not drawn many participants. The previous Global Marches (this year marks the third one) drew only a few thousand participants each. Counter-terror experts have revealed that Iran was backing the events. Israeli security officials said that they would be on high alert both days, but added that they did not expect either event to significantly impact on the daily routine of Israelis in any part of the country. The US embassy in Tel Aviv on Wednesday sent out warnings to American citizens in Israel to avoid areas where Arab demonstrations were taking place. “US citizens should avoid areas of demonstrations, if possible, and exercise caution if within the vicinity of any demonstrations. As always, US citizens should remain aware of their surroundings and monitor our public information for updates,” the embassy said.